Zoraida Córdova is a young adult author whose stories are sure to attract readers of all ages. She brings to life mystical worlds filled with magic and wonder. She is the author off The Vicious Deep trilogy, the On the Verge series and her new book Labyrinth Lost. 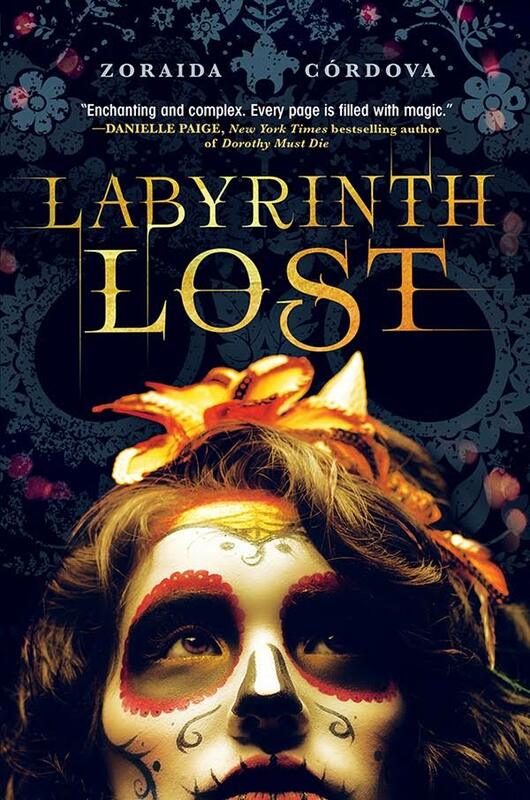 Labyrinth Lost is the perfect choice for readers who are trying to get into the Day of the Dead spirit. Zoraida Córdova’s magical tale centers around a seventeen-year-old named Alejandra “Alex” Mortiz, who comes from a line of brujas (witches, for the non-Spanish speakers). Alex has to come to terms with her magical ways and learn to accept them before trouble starts brewing. This book is infused with rich Latin American culture that’ll only captivate readers further with its magical charm. We got a chance to chat with Zoraida Córdova, not only to discuss her new book but take a deeper look into what her writing process is like and more. TYF: How did the story of Labyrinth Lost come about? Zoraida Córdova: I wanted to write a Latina version of Charmed. I grew up watching paranormal and supernatural TV shows, but the heroes never looked like me. Even the one time there was a Latinx on Buffy, she was a mummy who almost ate Xander. (Also, come on.) I think one of the slayers in Season 7 was Latinx. So, two out of seven seasons? Yay? Creating a magic that was new but familiar was crucial to developing this series. This magic is tied to their family and blood and roots and hearts. Book two is going to be way different from book one, and I’m proud of that. But the magic is still the same. TYF: Did the characters or plot come first? Or was it a mix of both? Córdova: Characters always come first for me. TYF: Can you walk us through your writing process? Córdova: I don’t have a single process. Sometimes I write in the day at a coffee shop. Sometimes at midnight at home. Sometimes I have music on. Sometimes not. The one thing I try to do with every book is outline! TYF: What does a typical day look like for you when you’re writing a new book? Córdova: I outline the whole story. It’s just the bare bones. Sometimes things arise while I’m doing the actual writing and I have to adjust. TYF: I read that you enjoy Greek mythology. Did Greek mythology play a role in creating Labyrinth Lost? Córdova: I wrote a post on this here. I didn’t use any greek gods, but the structure of the pantheon. With Los Lagos, I wanted to create a magical realm. The Deathday is a magical coming of age ceremony of my own creation. Like a Bat Mizvah or a Sweet 16, but for brujas and brujos. It is a time when a family gets together and wakes the dead spirits of their ancestors. The ancestors then give their blessing to the bruja/o. With the blessing, the magic can grow and reach its full potential. Without the blessing, well, bad things can happen. Like many traditions, they grow and become modernized. In Alex’s time, Brooklyn circa now, Deathdays are lined up with birthdays for extra festivities. Even though the Deathday ceremony was created for the world of Labyrinth Lost, aspects of it are inspired by the Day of the Dead and Santeria. El Dia de los Muertos, or the Day of the Dead, is a Mexican holiday that celebrates and honors deceased family members through food and festivities. Altars are filled with photographs, flowers, food and candles. The celebrations are then taken to the cemeteries where people play games, sing and even leave shots of mezcal for the adult spirits. The unity of death and family is what drew me to it, and one of the things I wanted to include in Alex’s life. One of the best books I’ve read on the subject was The Skeleton at the Feast: The Day of the Dead in Mexico by Elizabeth Carmichael. Santeria is an Afro-Caribbean religion that syncretizes Yoruba beliefs and aspects of Catholicism. It developed when slaves from Western Africa were taken to Cuba and other Caribbean Islands against their will. Slaves were forced to convert, but held on to their religion in secrecy, and used Catholic saints as parallels to their Orishas. Those who don’t understand it often see Santeria as a secretive and underground religion. Like some Santeros, the brujas of Labyrinth Lost use animal sacrifice, possession and connect directly to their gods. The Santeria Orishas, however, are not gods, but parts of the Supreme God. For further information, a starting point is Santeria: the Religion: Faith, Rites, Magic by Migene González-Wippler. For more information, check out the Author’s Note in the back of Labyrinth Lost. TYF: Did you encounter writer’s block while writing Labyrinth Lost? If so, how did you overcome it? Córdova: I don’t really believe in writer’s block. When I get burned out, I take a break. Like anything, writing requires that you take care of your mind and body. TYF: What was the last book that you’ve read and really enjoyed? Córdova: I’m Not Your Manic Pixie Dream Girl by Gretchen McNeil. TYF: Are you currently working on any new projects? If so, can you tell us a little about it? Córdova: Yes! I’m writing book two of the Brooklyn Brujas series. Alex’s story in Labyrinth Lost is over. But her sister Lula’s story has only just begun. You can expect new characters, magic and the fight for true love. You can add it to your Goodreads here. TYF: Lastly, since we are celebrating Booktober which highlights both Halloween and the Day of the Dead, what activity do you most look forward to during this time of the year? Córdova: On the Day of the Dead I will be lighting candles for my maternal grandmother, who is also my namesake. Since I knew I was going to be on deadline during Halloween, I took my yearly trip to Salem, Massachusetts, early. I went this summer. Every year I visit the museums, take a walking tour (sometimes historical and sometimes ghostly) around town. I eat lobster rolls and eat all the candy and drink hot cocktails at the Hawthorne Hotel. It’s a magical time for me.